Merry Christmas to everyone! This is the last day of my Christmas Calendar because in Austria we celebrate Christmas on Christmas Eve aka now 🙂 I hope you had fun with my Calendar! Thanks so much for flying with me! Ich war endlich mutig genug, ein Galaxy-Design zu probieren! Ich habe mich an der Maniküre von Kayla Shevonne orientiert und weihnachtliche Farben verwendet. Ich habe begonnen mit 2 Schichten China Glaze Ruby Pumps. Danach habe ich weißen und grün schimmernden Nebel mit Butter London Cotton Buds und China Glaze Running In Circles aufgetupft. Anschließend habe ich stellenweise den Glitterlack Sinful Colors Holiday Rebel aufgetragen. Zum Schluss habe ich kleine goldene Sterne aufgeklebt. 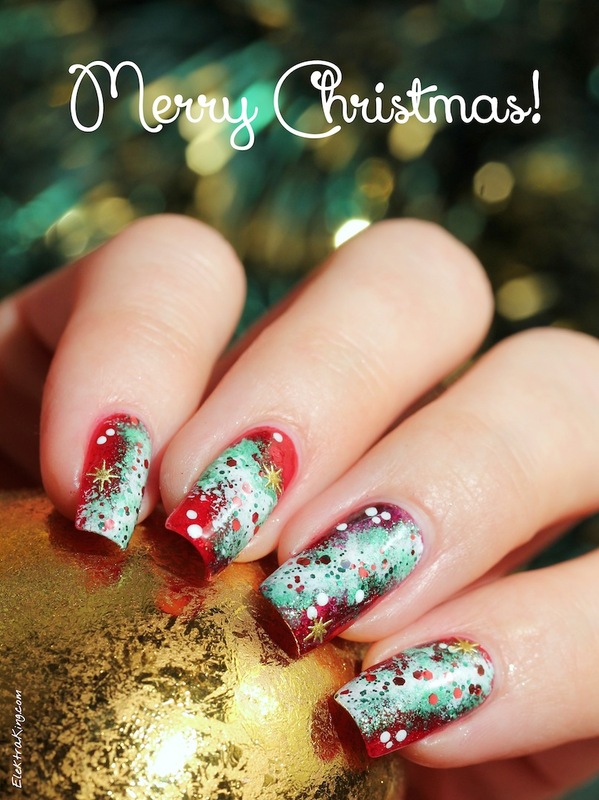 I was finally brave enough to try a galaxy nail art and I followed Kayla Shevonne’s design idea by using christmassy colors! I started with a base of 2 coats of China Glaze Ruby Pumps. 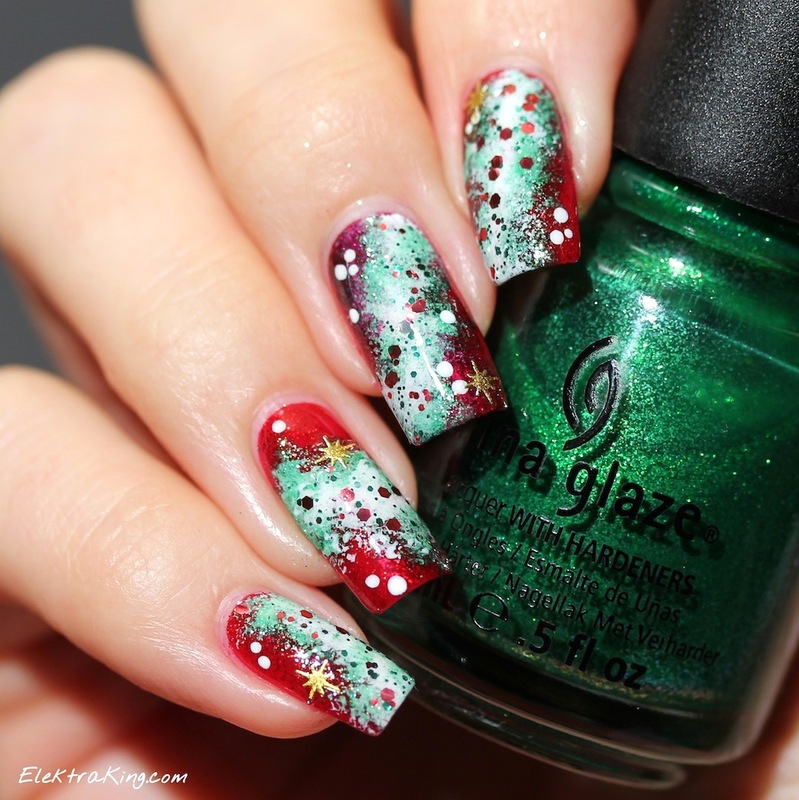 Then I did the white sponging with Butter London Cotton Buds and the green sponging with China Glaze Running In Circles. 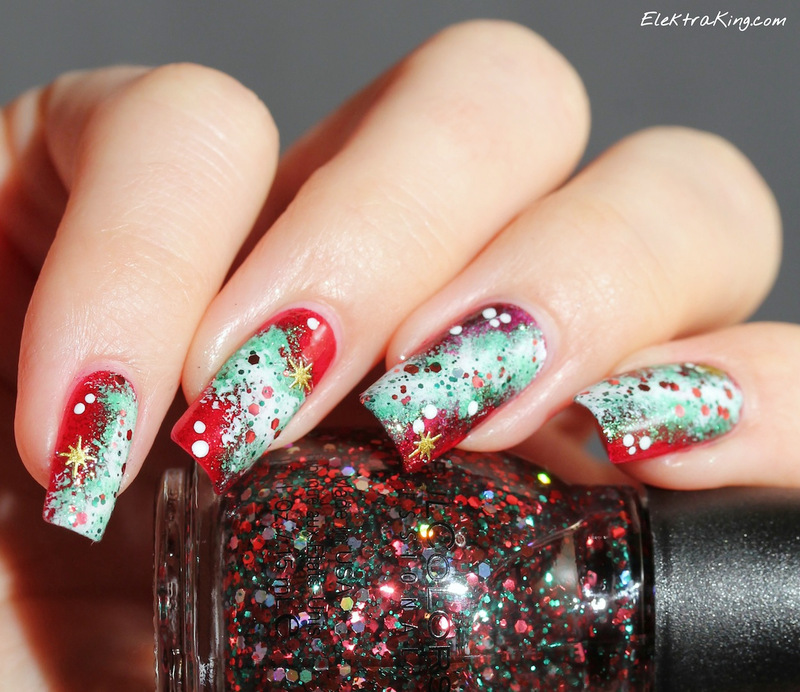 Next I added some glitter with Sinful Colors Holiday Rebel and made several white dots. I finished off with gold star stickers. Thank you! Merry Christmas to you too 🙂 I’m so happy that you keep following my blog! Wow, this is gorgeous. Very inspirational; I’d love to try this some time. Thank you for sharing, and Happy Christmas!